There’s never enough pumpkin. Using it in a savoury way helps to balance its natural sweetness. Best of all is when the squash’s caramelised flesh comes steaming from the oven, soft and sticky with lashings of olive oil, golden with subtle yet necessary notes of smokey paprika. 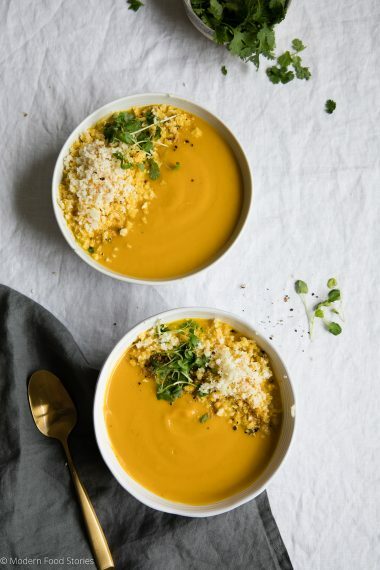 Just like in today’s Roasted Squash and Ginger Soup. Roasting the pumpkin first before blitzing is the key to getting real punchy flavour into this soup. The stock concentrated just so, bringing a depth of flavour rich, sweet, addictive I can’t help reach for seconds. A wonderful reminder that with Autumn, comes comfort and happiness. 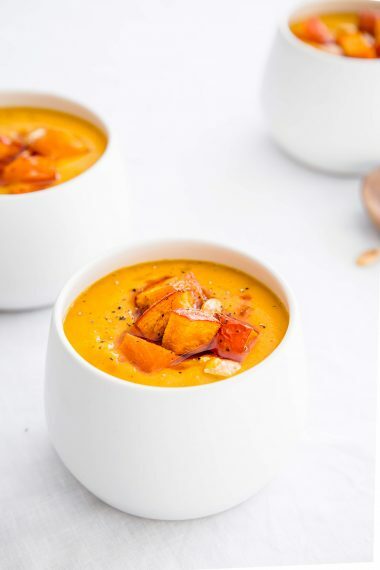 This Roasted Squash and Ginger Soup recipe is free from the top 14 allergens. 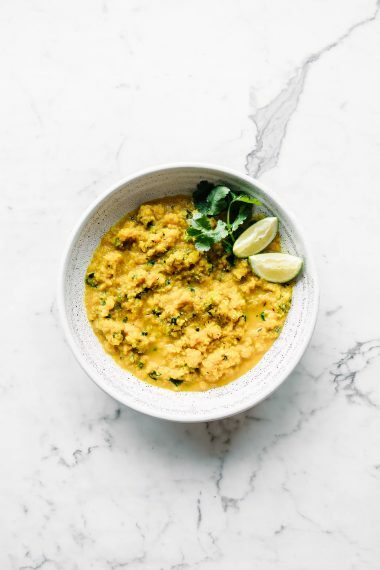 As are all my recipes it’s also dairy, gluten and grain free making it suitable for those of you following gut healing plans like AutoimmunePaleo, Paleo, Keto, Whole30, Gaps and SCD. What dishes do you crave as fall approaches? Peel the butternut squash and chop into chunks. Place on a baking tray and toss with 1 tablespoon of olive or coconut oil, 1 teaspoon of paprika and a small pinch of salt. Roast in the oven for 30 minutes until soft and golden. Meanwhile, place the stock in a pan and simmer on a medium heat for 20 minutes. This will concentrate the stock and make the soup taste delicious. It’s what gives it the real depth of flavour. Peel the onion, garlic and ginger. Dice the onion and garlic fine but keep separate. Grate the ginger. Heat 1 tablespoon of olive or coconut oil in a pan and gently sauté the onions on a medium heat for 2.5 minutes. Add the garlic and cook for a further 30 seconds. Add half the ginger and all of the roasted squash. Fry for 1 minute. Add the concentrated stock to the butternut mix (you should have about 900ml left after concentrating), coriander, cinnamon, rest of the ginger and 1/4 teaspoon more of paprika and simmer on a medium heat for 15 minutes. Blitz in a high speed food processor (I use a Vitamix as the speed of it makes soups extra creamy without having to add dairy.) A hand blender would also work just fine if you don’t have Vitamix / Nutribullet equivalent. Stir through the juice of a good squeeze of 1/2 a lime. Finely dice the kale, or shred in a food processor like I have to make it really fine. 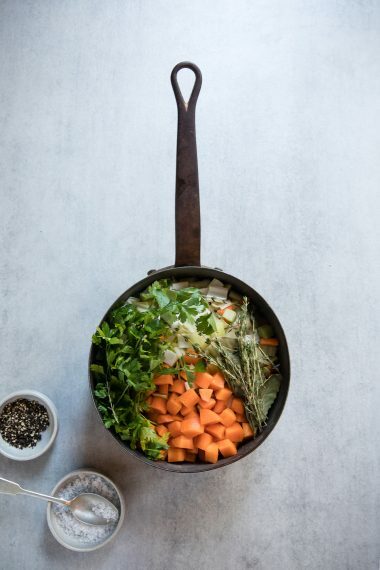 Heat the last tablespoon of oil in a pan (I like using coconut oil here,) add the kale, a small pinch of salt and gently fry for 2 – 3 minutes on a medium heat until crisp. 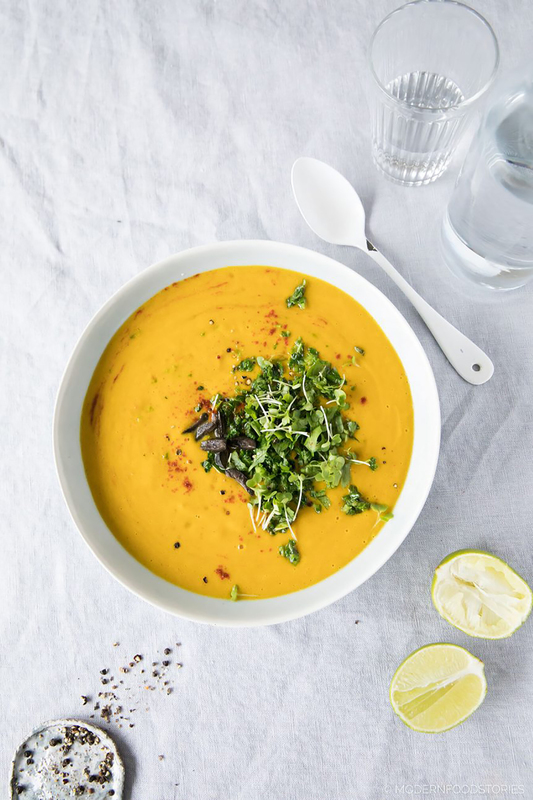 Top the Roasted Squash and Ginger Soup with crispy kale, chopped fresh coriander, chopped olives and swirl on top sun dried tomato puree. (To make your own simply blitz half a jar of sun dried tomatoes in oil in a food processor, use all the oil in the jar. Store the left overs in the fridge for up to a week.) Option to sprinkle on extra seasoning of salt, pepper and paprika to taste. If you’d like to see more #FreeFromHarvest recipes, please check out my friends in the #FreeFromCollective. We’re a friendly tribe striving to make free from cooking effortless and tasty. Don’t forget to pin this image on Pinterest to give it a try this Winter. It really is awesome!